Ciao ! Wow what specialty you made with the white chocolate !! I adore the red kitchen !!! Anne, it has been such a joy to get to know you through blogging and bake along with you these last few years. Thanks for all your comments and encouragement. Happy new year to you and your family! Wow, love the white chocolate thumbprints - this is unique this week. It's been fun baking along these last few years. I adore Baby Strawberry's kitchen - just gorgeous. I love your thumbprints, Anne... so fancy! :) And that play kitchen is just adorable. Hope to bake along with you through BWJ - all my best in 2012!! I love the red kitchen--what a locky little baker. TWD has been an awesome experience, I've learned a lot and met many new friends. I've enjoyed checking your blog each week. You always put a fun twist on recipes. Thanks for all your kind comments. Your cookies look beautiful, I love that filling! It's been fun baking with you these past years...amazing how big Little Strawberry is already...time just flies and is so evident when we view it watching our children grow. Love that new little kitchen! Perfectly adorable, Nana did great! 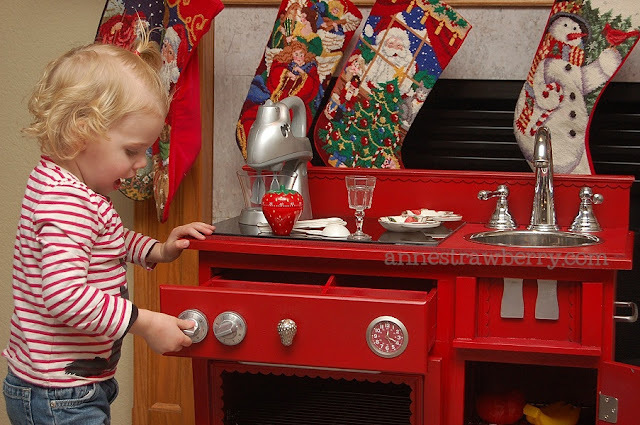 Would Little Strawberry mind if I used her adorable red kitchen. What a great Nana she has. Glad we got to bake together and look forward to sharing BWJ with you. LOVE your white Choco thumbprints. Ooh, yum white chocolate would be perfect. It's been nice getting to know you through TWD. Those are some yummy looking cookies! Thanks for baking along. It's been a pleasure. How beautiful with the white chocolate swirled in the indentations! Baby Strawberry is a doll and I'm sure she really enjoyed her red kitchen. My granddaughter has the same one and loves it. See you in Baking with Julia. That is a gorgeous red kitchen! You win with the white chocolate centers! Hope you'll be joining BWJ. What picture perfect photos - so inspiring! Loved your adaptation on the cookies (magazines should know about this one)! Happy New Year! Her first kitchenaid - seems she is coming after her mum :o] Thanks for all your wonderful blogs and pictures, I always enjoyed them! you always make such beautiful sweets...it has been a pleasure to visit your blog on tuesdays. and btw, that is the most fab play kitchen i've ever seen! 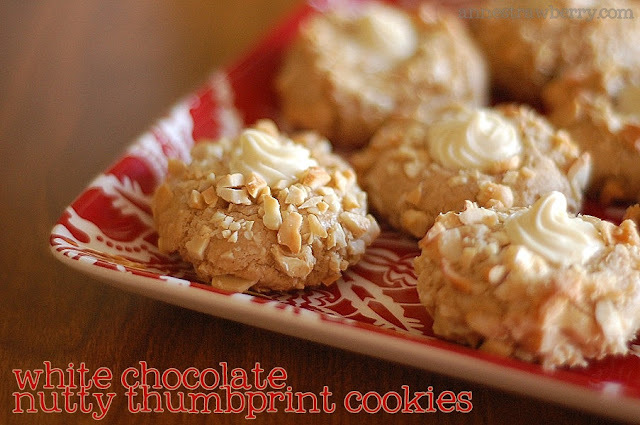 Love your thumbprints with the white chocolate twirl! It has been a blast baking through this wonderful book with you. I wasn't going to hang around for BwJ, by Kayte twisted my arm right off my body so I'm going to do some. Maybe not all (like, wedding cake, are you kidding me???) See you in February! Of course, you managed to make the thumbprints look so elegant! And that play kitchen is unbelievable - I wish my own kitchen looked like that! It's been so much fun reading your blog over the years - glad you are keeping up with Baking with Julia! So that is what all the spray painting was about! I should have taken a walk down the street to see it in person. That is one adorable kitchen! Great job Nanna! My husband would love your white chocolate version. Great kitchen! We have two (though not as gorgeous as Little Strawberry's), and they still get played with all the time (my girls are 5 and almost 9). 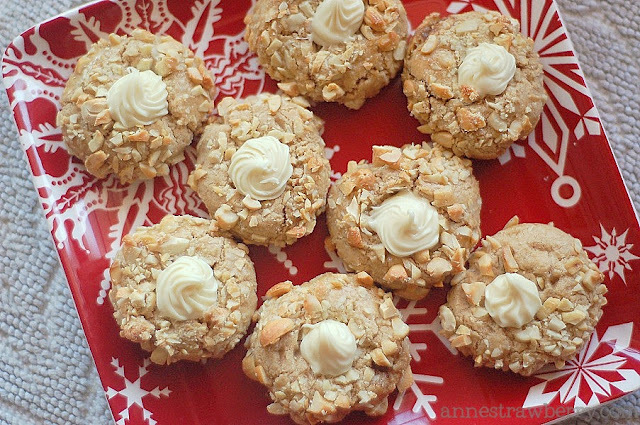 What a fine twist to add white chocolate to these great cookies. And I love the red kitchen! Looking forward to seeing more of your posts in the coming year! Happy Baking to you and your little one.